#BecauseofHim I am inspired. Everyday. Whether its because I turn to the scriptures and talks from General Conference or as I kneel in prayer in His name. I receive inspiration during the lessons at church, while teaching others, and as I share my testimony. I even receive inspiration as I drive back and forth from school with my kids. If we are willing and open to His words, the inspiration is there. I'm so thankful to have continued daily guidance. Through inspiration I know where I am going, where I came from, and what I supposed to be doing right now. Right now my second oldest daughter and I are reading the Book of Mormon together as she prepares to be baptized next month. It still surprises that each time I read the Book of Mormon, I learn new things, see things that I just know weren't there before (right? ), and understand something in a new light or on a deeper level. I love being able to read the scriptures with her as it gives me a different perspective. Last year I read all the standard works and it was incredible. Reading at different speeds, with different purposes, and with different methods always opens the floodgates of inspiration for me. I am so grateful for the inspired knowledge that I have gained throughout my life and the loads that are still ahead for me. 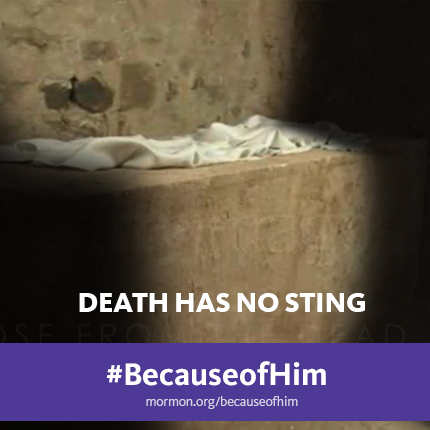 Read more about the #BecauseofHim photo challenge and video at Mormon.org/easter. Psst...still need an Easter lesson or devotional for tomorrow or even some Easter egg fillers? I've gathered some great resources for you! Happy Easter!